MENLO PARK, Calif., Jan. 24, 2019 /PRNewswire/ -- From technological developments to shifting working dynamics, there's no question that today's creative teams are challenged by constant and accelerating change, new research suggests. 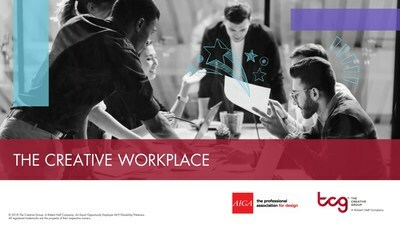 Staffing firm The Creative Group, in collaboration with AIGA, the professional association for design, surveyed more than 1,000 workers in the creative and marketing industries to find out how they feel about their jobs, companies and career prospects. Technology is both a blessing and a curse. Forty-five percent of industry professionals feel advances in technology will create greater employment opportunities for them. However, a majority (88 percent) said that keeping their skills up to date will be difficult. Digital improvements are needed. Forty-five percent of respondents said their company is slow to adopt new technology, and 70 percent rated their employer's efforts to prepare them for such adoption as fair or poor. When asked what technical skill they'd most like to develop, the top response among creatives was web and user experience design. Workers crave more flexibility. Nearly seven out of 10 professionals (69 percent) wish they could work remotely more frequently than they currently do. Respondents also ranked in-person meetings as the most effective communication method. Creatives are eager to make a career move. Sixty-one percent of industry practitioners said they are more confident in their professional prospects compared to one year ago. In addition, 60 percent said it's likely they'll look for a new job in the next 12 months. The top reason creatives are considering leaving their current company is limited career growth opportunities. Freelance hiring is heating up. Thirty-seven percent of creative teams expect to rely more heavily on project professionals in the next three years, mainly to help with heavy workloads. Graphic design, web design, video production and photography are the top areas of freelance hiring. "Creative teams are under increasing pressure to innovate and use new technology to solve business problems and deliver improved customer experiences," said Diane Domeyer, executive director of The Creative Group. "To meet growing demands, companies are relying on a mix of talent, from full-time employees to project professionals. This flexible staffing approach offers many benefits, including cost savings and access to a broader talent pool." Domeyer added, "To recruit and retain top creative talent in today's competitive environment, it's no longer enough to offer attractive pay. Companies must also foster a positive workplace culture where employees have access to the latest tools to do their best work and opportunities to grow their careers without leaving the firm." "The change in the nature of design work calls for skills and perspectives beyond traditional college-level design education," said Dana Arnett, AIGA national board president. "It is critical that the industry expands its knowledge and expertise to remain economically viable and professionally relevant as it prepares for changing client demands and new opportunities." "Learning new technology can be daunting, but it will open doors to many professional opportunities — and it's critical for success," Domeyer added. "Agencies and in-house departments alike seek candidates with digital proficiency. Skills development should be an ongoing priority for workers who want to reach their full potential." Visit The Creative Group blog for the full survey results, additional creative workplace trends and insights from industry leaders on navigating change. The Creative Group (TCG) specializes in connecting creative, digital, marketing, advertising and public relations talent with the best companies on a project, contract-to-hire and full-time basis. For more information, including job-hunting services and candidate portfolios, visit roberthalf.com/creativegroup. AIGA, the professional association for design, advances design as a professional craft, strategic advantage and vital cultural force. As the largest community of design advocates, AIGA brings together practitioners, enthusiasts and patrons to amplify the voice of design and create the vision for a collective future. AIGA defines global standards and ethical practices, guides design education, inspires designers and the public, enhances professional development, and makes powerful tools and resources accessible to all. Learn more at aiga.org.